Information on the current state of the project “Innovation and modernization of Gabčíkovo Water Components”, its activities, objectives and work progress in terms of the project implementation plan were the subject of a lecture at this year’s Hydroturbo 2018 Water Conference on Water Energy, 27 September 2018 held in Bratislava. 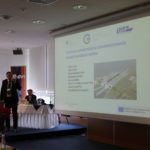 More than 150 participants, including Russian representatives from the Moscow Power Engineering Institute (MPEI), representatives from ČKD Blansko Engeneering, a.s., Mavel, a.s., Slovenské elektrárne, a.s., ČEZ, a.s., CREA Hydro & Energy, z.s. E.ON, as well as experts from the state enterprises Vodohospodárska výstavba and Slovenský vodohospodársky podnik. 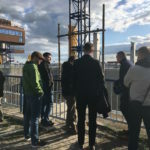 In addition, on the first day of the conference, the participants learned about the project and directly on the Gabčíkovo Hydro Power Plant as part of an excursion on both the energy and the fairway part. The 24th Hydroturbo 2018 Conference was organized by the Department of Hydrotechnics of the Faculty of Civil Engineering of the Slovak Technical University in Bratislava in cooperation with the state enterprise Slovenský vodohospodársky podnik. Hydroturbo is an international conference with over 40 years of tradition. It focuses on the area of ​​operation, construction and development of water turbines. At Hydroturbo, every second year, top watercraft experts and suppliers of these facilities meet with hydropower operators to share new knowledge and experience from both practice and research.